* Repetition is key. Say it, sing it, sneeze it, speak it in a Santa voice, it doesn't matter just repeat the daylights outta that word with the children. And maybe a couple of them will retain it. On the first day. So do it all over again every other day of the year. And maybe a couple more will have it by the end. * Make learning unusual. Everybody remembers their first time...to ride a bike (what did you think I meant?!). So if you offer the children a unique experience when learning something for the first time, that fun memory will be embedded in their brain along with the word. *Words, words everywhere! I need to improve upon this. Kids love to read and they want to learn. So why not get those words on every stinkin' surface?! Give the little people what they want! *Use those words. If we don't use them in some sort of context then they just remain words floating in outer space to the kids. Teach 'em and use 'em. That's what I'm trying to do anyway. When introducing new words for a new unit of art study, I have them written out and in my red chart (see above with grade levels indicated at the top). Then I play these coupla of games. I'm hoping these clips make some sense of my madness. Em, our friend across the pond, says, "I'm a classroom teacher in the UK. I have a word wall and I add to it as the children suggest words in shared writing or we find words in shared texts and we refer to it often but it takes tome for them to learn to do this independently. It's literacy based but I also use vocabulary cards in maths a lot as this is an area which has a lot of vocab. I hold up the cards as I talk and display them on the whiteboard and they often have pictures and symbols with them to help with meaning. The children have learnt to question me whenever an unfamiliar word is used which helps them learn the meanings. You could play quick games like give half the children a word and the other half the definition either as a sentence or picture and they have a minute to find their partner. 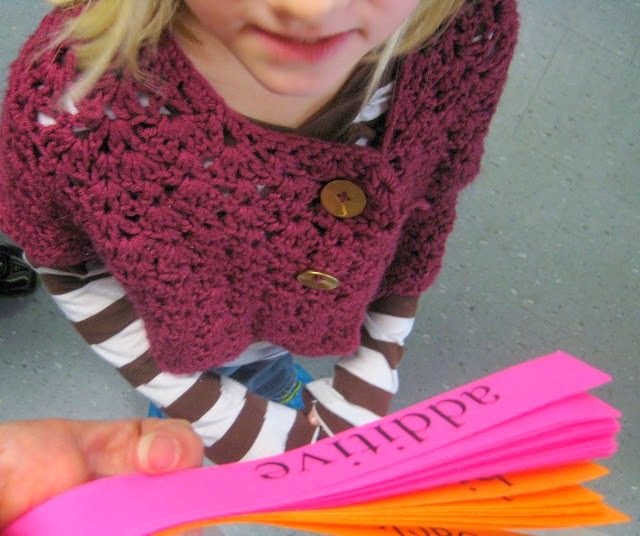 Or hide words around the room and ask them to find the word that means... I print out words in tiny writing and give the children magnifying glasses to read them, making them feel like word detectives. You could have 'word of the day' displayed and reward those who use it correctly." Kids playing Clap-Clap, Snap-Snap and wondering why I'm taking their picture. 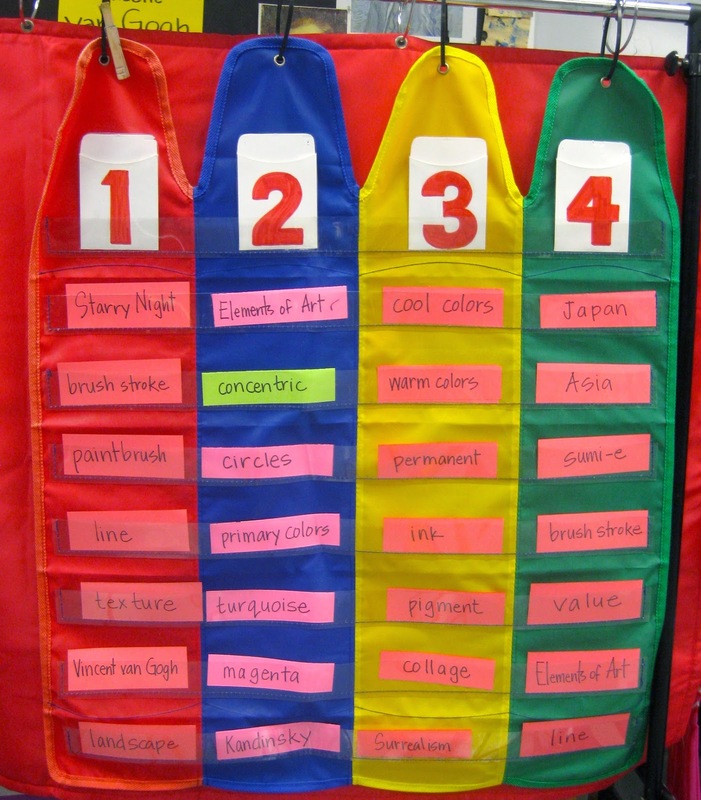 Cathy who blogs at Splats, Scraps and Glue Blobs says, "Last year I was trying to think of everything possible to help kids remember art vocabulary words. There is a restroom across the hall from my art room and most of the classes use these RR's before coming into my class. So I made vocabulary word posters with pictures and hung them on the backs of the doors. Kids didn't even realize they were learning." Now just talking, clapping and snapping words is one thing...but without putting them in some sort of context, it's kinda pointless, don't you think? I got this idea for putting a different spin on my "I Can" statements from Don over at Shine Brite Zamorano. This is new for me...and I'm trying to add reading this to my teaching routine. My normal routine is simply have the children repeat all of the direction they are to follow during the course of the class. However, add this will add more context to those words. If you've not been by this blog, it's a must, ya'll! And there you have it! I'm still working on my vocab teaching methods so any clever tricks in the comments are much appreciated. Thanks for dropping by you guys! Hey, Kids! I interrupt this post to let you know I'm at the NAEA convention in San Diego! I'd love to see you and have some dates and times we can meet up. Follow this linky-loo and I'll see you there! Wuz up, Party Pandas, er, People? 1. It freaks out the "I'M NOT AN ART TEACHER!" sub who seems to think my plans are written in hieroglyphs (which they usually are because I like pictures). Upon my return, I either get the stink eye from 'em which translates to "what in the world did you put me through?! It was like reading the no-words instructions from Ikea!" or the furrowed eyebrow/twitchy-eye face which means "I tried to explain what a "landscape collage" was but we couldn't figure it out. So we resorted to glue eating and sharpie sniffing. And it was AWESOME!" 2. Because the kids, fully aware that their sub is NOT AN ART TEACHER! and, therefore, easy prey, pretend that they have no idea what the sub is talking about. From there, they use their kid-manipulation tactics to convince el subbo that it's perfectly normal to color our hands in marker and stamp it on their face. Like a Kid-Manipulatin'-the-Sub Boss. Knowing this, and knowing I needed some sub plans for all grades in a pinch, I decided to leave some step-by-step panda drawing instructions for the NOT AN ART TEACHER! sub. And, I'm excited to say, everyone loved it. I have no idea. Bob? Who are you and why are my 4th graders obsessed with you and mustaches? I can only imagine you are some curly-mustached hipster. In skinny jeans. Which should be banned form the dudes' clothing department. But I digress. Why a panda, you ask? (okay, so you didn't ask but Ima gonna tell you anyway). Well, my students are currently learning about Asia and our panda friends reside in China. We're gearing up for a clay project/fundraiser (we want to help those pandas!) and I thought this would be a super fun way to get the kids in the mood. In my sub notes, I asked the sub to follow my routine of having the children gather on the floor. From there, I asked the sub to talk through and demonstrate drawing a panda with the children. These directions were big enough for the children to see once at their seats. However, just in case they needed a closer view, I did make photos copies of the same directions and had them ready on the tables. I'm happy to say that each of my subs drew a panda...and was actually thrilled by their own artistic skills! Several left their drawings out for me to admire and hang on my fridge. Just a couple of reminders from who the students and I have dubbed "Señor Roy G. Biv". The children were given only ONE SHEET of paper (make it work, kids! Tim Gunn's watching!) and a black oil pastel. This can be a bit dangerous as those oil pastels can get everywhere (I had one kindergartener unknowingly rubbed his chin and a buddy said, "you look like a hobo!") but I left out oodles of baby wipes and a warning of the danger of smears. Since the kids were only given one sheet of paper (anyone else cringe at the sound of a paper being crumbled?! "Why you wanna be a tree killer, kids?! "), you can see this student practiced a couple of different ideas before giving it a-go on the front. Now, one of the reasons I had a sub is because I'd taken my fourth grade on a field trip! When we returned from our trip, I had, like, 10 minutes before my classes started pouring. Since they had drawn the pandas the previous day, I simply had a coupla kids get watercolor paints on the tables and we were good to paint our pandas! We chatted about a couple different methods for painting our panda backgrounds. My art teacher BFF's (hiya, Mallory!) has recently been doing this patchy wet-on-wet painting process with her students. You can see this in several of the pandas above. To do this, you paint a very small patch of color on your paper. I explain to the kids that a wash is a color light in value. From there, I show them the wet-on-wet technique of adding those dots of color and watching the dots grow. These paintings were completed by my fourth grade students. We've actually been doing a lot of watercolor painting lately so they are kind of experts. Many opted out of the wet-on-wet and did their own thing. Which is awesome. For more details on the kind of watercolor paint I use...and the specifics of how I teach those kids not to grind their brushes into their paper, go here. And there you have it! I hope you'll give these Party Pandas a go...and if you do, please email me some photos, I'd love to see them! That's right, ya'll! 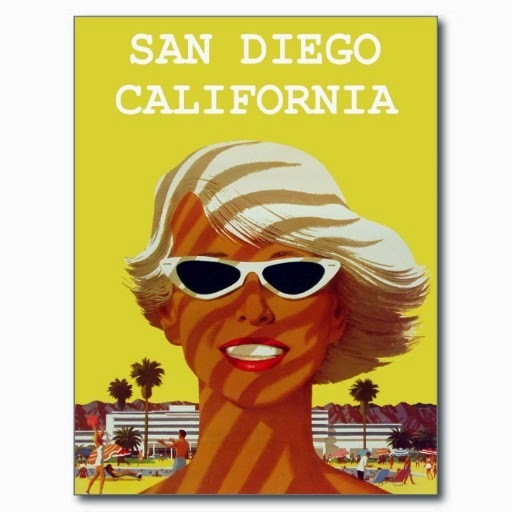 I'm peeling' off my layers, kicking' off my boots and heading out to the NAEA (that's National Art Education Association aka Art Teachers Gone Wild) Convention in Sunny San Diego! I've already started packing my bags (all those outfits, you know. A Crazy Art Teacher's gotta look good), writing my sub plans and getting super stoked to meet up with art teacher buddies! I'm so looking forward to this Art Teacher Adventure. If you are going, just a coupla announcements. First of all, I'd love to meet up you! Many of you lovely readers I've become blogger buddies with and it would totally make my trip if we could get together. One chance for that to happen would be when I present, along with some incredible art educators (I'm sure to have a fan-girl moment, ya'll! ), on the Elementary Division Carousel of Learning on Advocacy on Sunday, March 29th, from 9:30 - 10:20am in the Hilton Hotel/Indigo 2014B/Level 2. My presentation will be about finding your passion (mine's fashion...now, whether or not I'm fashion-able is still a question although that's not open for debate at this forum. Thank goodness)and how that to use it as your advocacy tool. Another chance for us to get together would be at the Blogger Meet and Greet hosted by The Art of Ed! This will also be Sunday (so if you see me running frantically in what will most definitely be inappropriate running shoes, hand me a cuppa water and cheer me on) at the AOE Booth, number 310, from 11-12pm. There will be some of your fave art bloggers there (I'm taking my autograph book), as well as Jessica, the woman behind AOE! You won't wanna miss this event. If you can't make it to that, or you'd just like to sit and chat in a more intimate setting, I'll be chillin' out with a cuppa tea and a scone at Starbucks in the Hilton Convention Center on Sunday from 12:30 - 1:30pm. I'd really love to meet and chat with you so be sure to pop in if only for a moment! This weekend, my super sweet mother-in-law helped me prepare 20 Giveaway Bags for the first visitors to hang with me at Starbucks. You won't wanna miss these, ya'll. I can't tell you what's in the bag...but I can tell you, you'll love it. In case you miss out on that, no worries! For the following 10 visitors, I'll have 10 Copies of My Most Popular Lessons From My Blog. And for the rest of ya, I give free hugs and high fives. Lookin' forward to meeting' ya'll! Ohhhh, goodie bag goodness. I do believe you'll love the DIY that's inside. 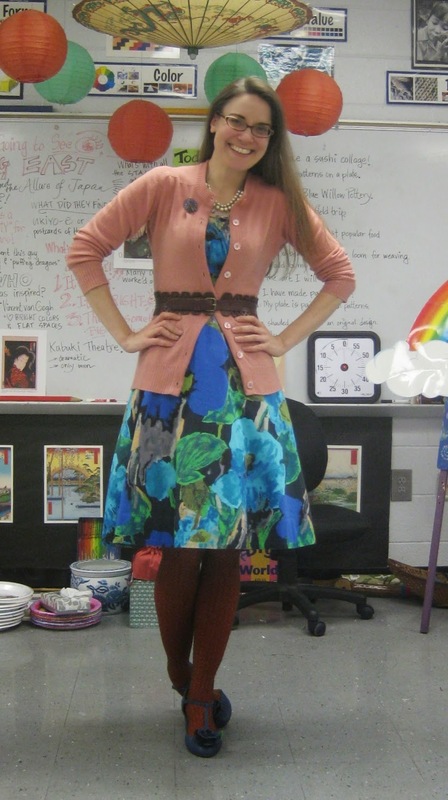 Best Dressed Art Teacher Contest! Simply send an email to me at cassieart75@gmail.com with a photo of your best artsy look. Photos and bio will be shared on this blog on April 20th. Open voting on this blog will end on April 30th and the winner will be announced May 1st! So! 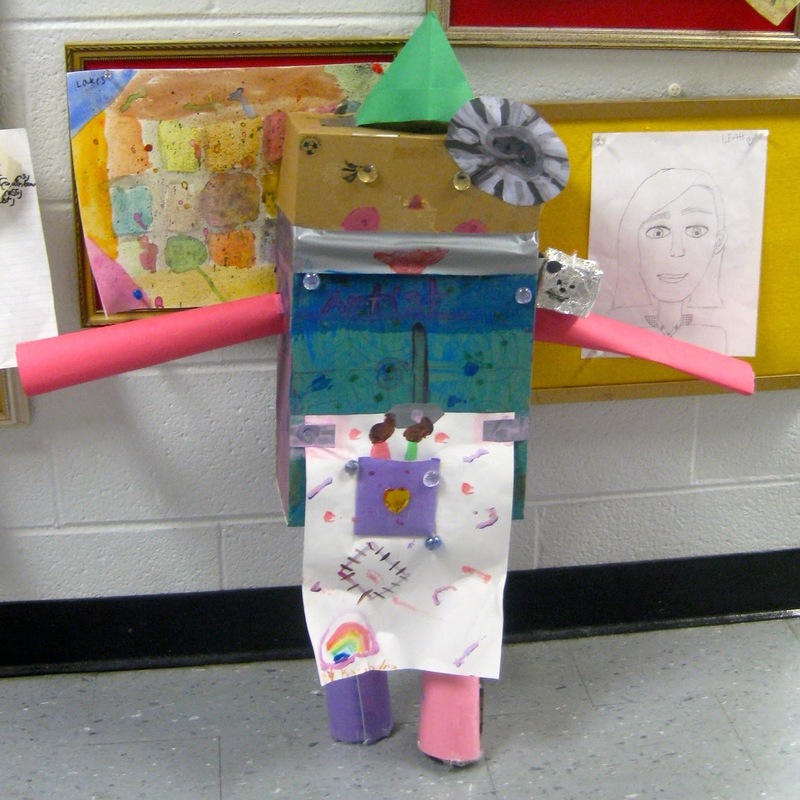 Even if I don't see you at the convention, I sure hope to see you in my "in box" wearing some amazingly glorious art teacher-y outfit! Have fun getting dolled up! 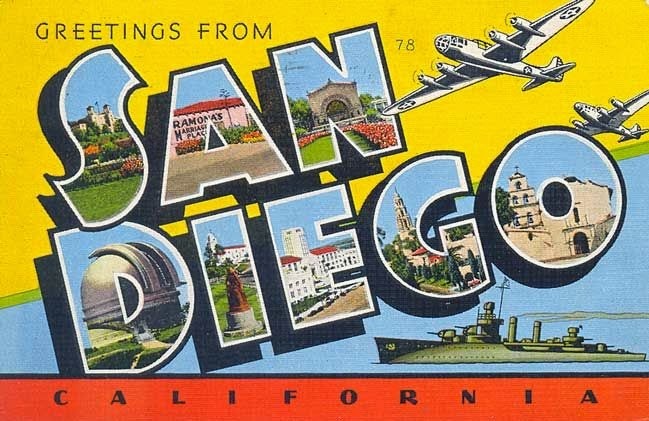 The rest of you, see you in San Diego! Hellooo, long lost friends! I hope you've been having a super wonderful week. It's been great here as I'm currently enjoying the last days of my Spring Break! Hubs and I set off on a California Adventure that involved lots of hikes, trips to Disneyland, a visit with a good buddy from college and strolls on the beach. Oh! And shopping. Loooots of shopping. I might have a problem but until they make some anti-shopping pill (that would ONLY be invented by a straight man, mind you), I'm ownin' this problem. All that set me a pinch behind in blogland. 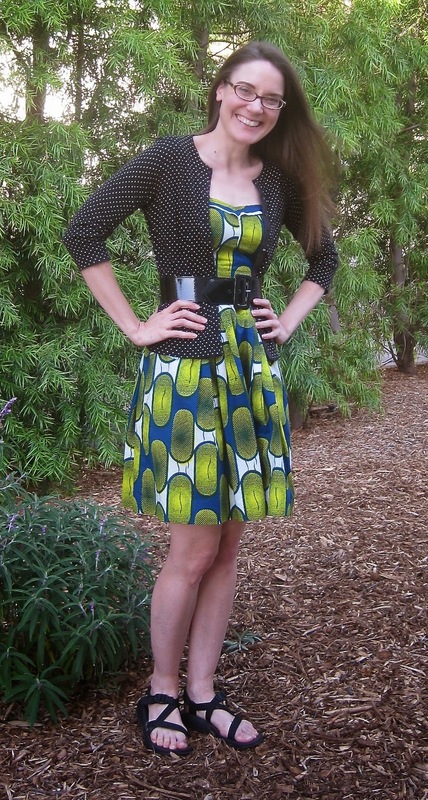 So what you see here are photos of what I wore leading up to my break...which seems like forever ago! When I return to school on Monday, it's gonna be the start of The World's Craziest Week: field trip to the art museum with my 4th grade on Tuesday, new rotation of afternoon sewing club for kids on Wednesday, school carnival on Thursday (where I'm sitting in the Pie in Yo Face booth, joy!) and flying out to the NAEA convention in San Diego on Friday. Just thinking about next week and all that I have to do kinda freaks me out a little. But in a good way. 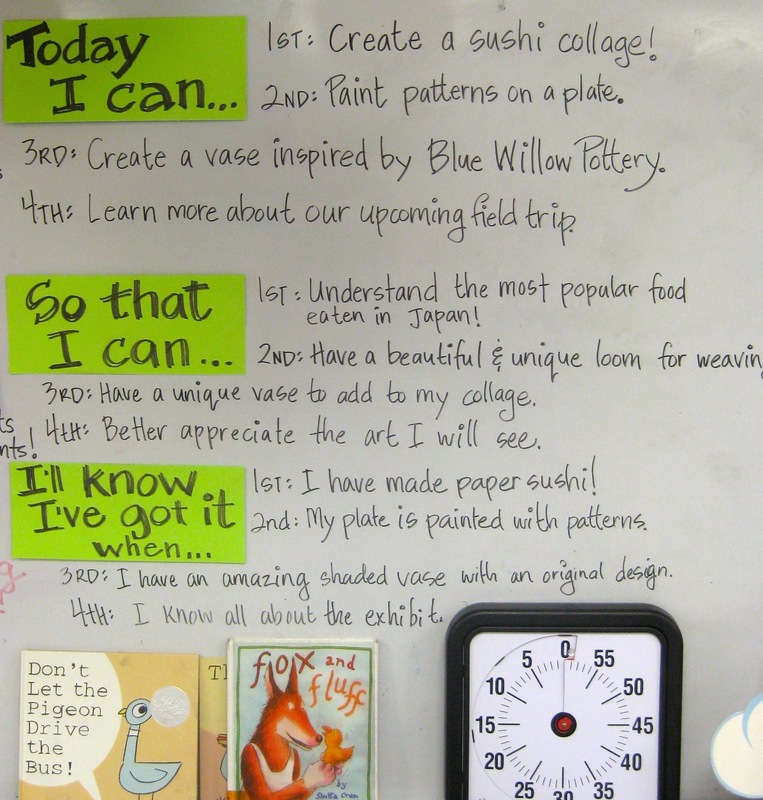 Since my 4th graders will be visiting The Frist Center for Visual Arts to view their Looking East: Western Artists and the Allure of Japan, I thought I'd share with you some of the pieces they'll be seeing along with a wee background history of the exhibit. Enjoy these beautiful works and I'll be back with you soonish! 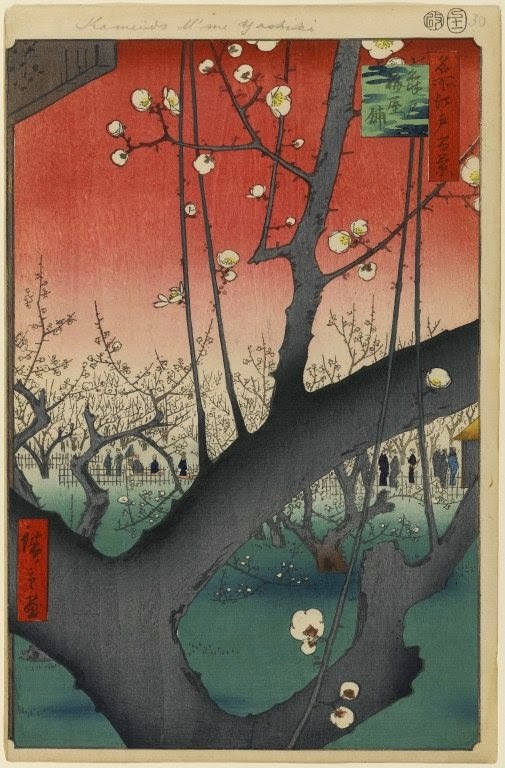 Utagawa Hiroshige, Plum Estate from One Hundred Famous Views of Edo, 1857. So in the late 1850's, after some strong persuasion from the United States (read: we had lots of big boats and weapons), Japan signed trade agreements with the Western nations after 200 years of self-imposed isolation. I can only imagine how the artists of that time most have felt seeing the "exotic" works of art by artists such as Hiroshige. 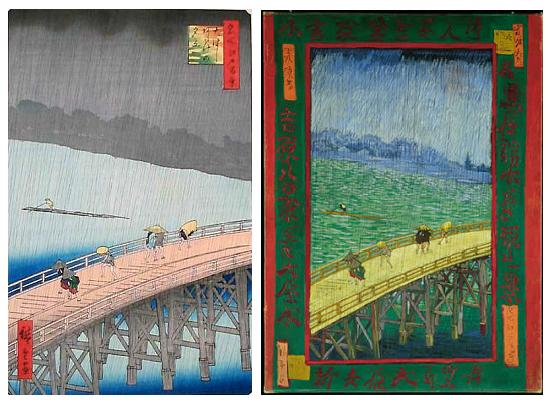 The Bridge in the Rain, original by Hiroshige (left) copy by Vincent van Gogh (right). 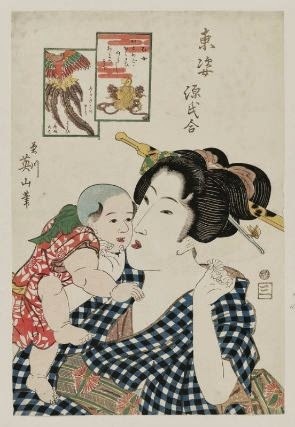 One of the most popular pieces of art that influenced such Western artists as van Gogh, Monet and Cassatt where Japanese prints often referred to as ukiyo-e. These works of art were mass produced for the common man and meant to serve as a kind of postcard of a place or event. Ukiyo-e translates to "the floating world" which means that many of the depictions were of the entertainment world in Japan at that time. These prints were created by a team that consisted of artist, carver, printer and publisher. 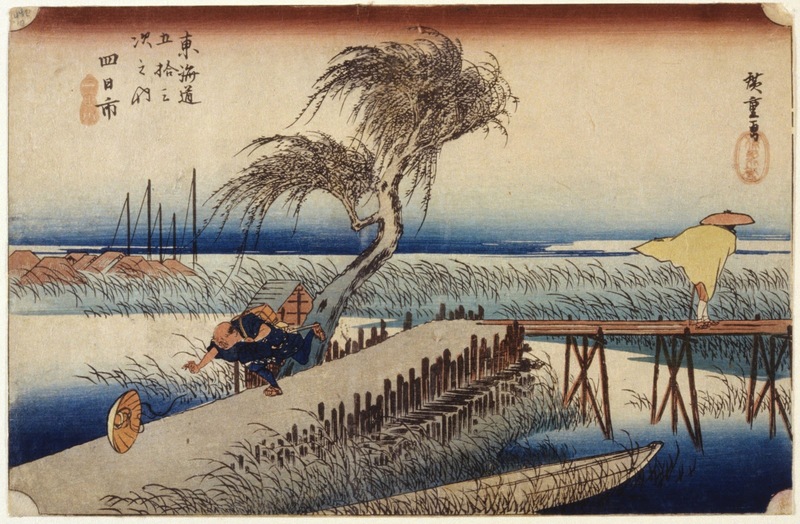 Hiroshige was the artist behind many landscaped-themed prints. Apparently, in Japan, one could not simply travel within the country without passports and permission from the government. For that reason, landscape prints were created to give folks a view of other parts of Japan. 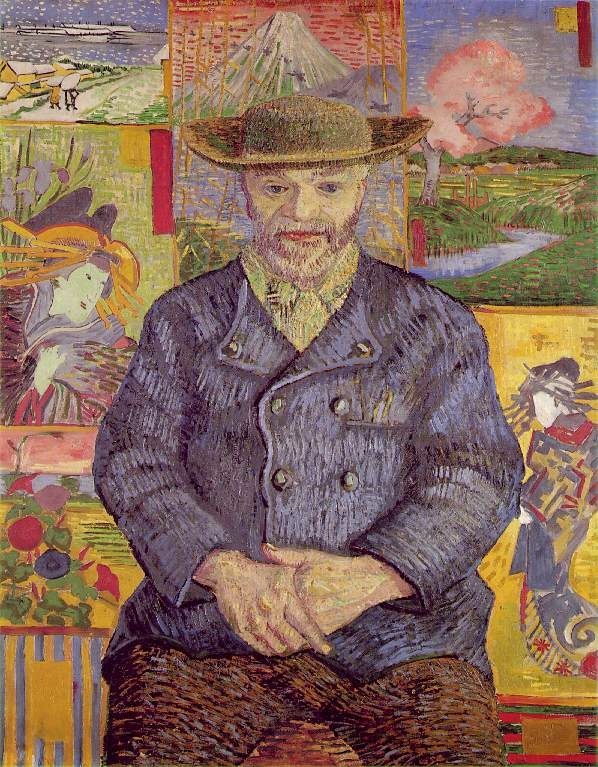 Père Tanguy, by Vincent van Gogh. Oil on canvas, 1887. After discovering Japanese prints, van Gogh seemed to also discover color. Don't believe me? Google that nuthin' but brown painting Potato Eaters and tell me I'm lyin'. Utagawa Hiroshige I, Yokkaichi: Mie River, 1833. Take a close look at this print and tell me Hiroshige wasn't a funny dude. I love the guy chasing his hat and the dude with his jacket flying up. This reminds me of an Aesop's fable that was read to me as a kid (I LOVED those fables, did you?). In it there was this argument between the sun and the wind concerning which was more powerful. They decided to test their strength on a man walking down the street. It was decided that whoever could get the dude to take his coat off was the winner. The wind blew and blew only to find that the man wrapped his coat around himself tighter. The sun simply had to shine and it's warmth convinced the man that his coat wasn't needed. I have always loved that story. I like to think that it means you can't convince anyone by simply blowing hot air but by being yourself you'll shine and people will take their clothes off. OR something like that. 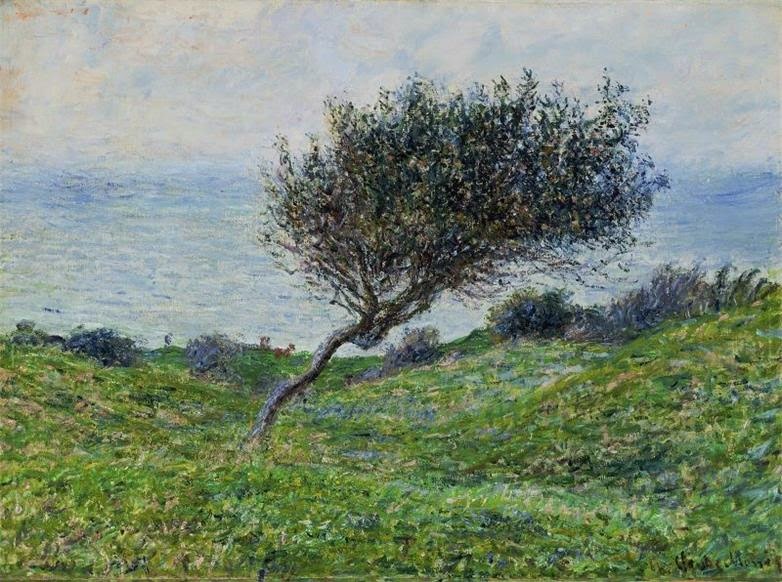 Claude Monet, Seacoast at Trouville, 1881. Okay, look at Hiroshige's print...and look at Monet's painting. Coincidence? You decide. Kikugawa Eizan, Otome, 1818 . So one Big Fat Hairy dif between Western works of art and these from Japan is that in Western art, painting a likeness was important. You won't find that in Japanese prints. Often because they are more about a story than they are the specific characters in that story. 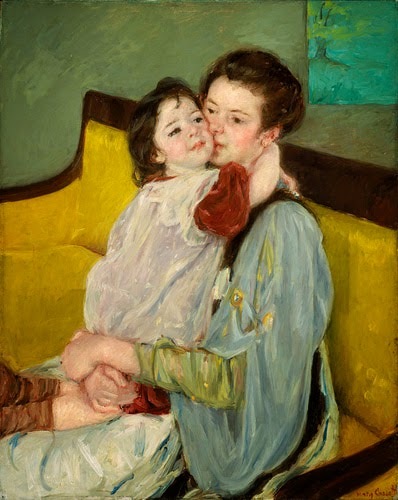 Mary Cassatt, Maternal Caress, 1901. So I've looked at this painting several times and JUST NOW noticed the weird amputated hands. Whuz up, Mary?! They claim Cassatt was influenced by the Japanese but I'm not real sure. Maybe because of the flatness of the background? Or the intimacy portrayed which is similar to the print above? I think Cassatt would have painted these pieces regardless of the influence. They were inside of her, bound to come out. Just how did I attempt to prep my students before next week's big field trip? My idea was to create a powerpoint but (brace yourselves) I've never made one. That's right, I'm fighting the 21st Century. But every time I started to create one, I just thought of all the terrible ones I've had the displeasure of sitting though. I wanted this field trip to be exciting! So I recalled a Ted Talks where an artist created exciting "notes" taken during a presentation. I decided I'd do the same for my chat with the kids about our trip. They seemed to enjoy it and didn't even notice that we talked our way through an entire class without getting up from the floor and making art. Ha! Fooled 'em! Wish me luck on the field trip! I will most definitely have nightmares the night before (I ALWAYS do!) but I'm so excited about out adventure. I'll keep you posted. Chat soon! Er, where was I? Ah, yes. My addictamacation to needle felting and the fact that every other blog post features something I've stabbed (with a felting needle, people!). Don't believe me? Well, if I've counted correctly, I do believe this here is my 11th felted creation. It's all that stabbing, kids. It's such a stress reliever. It all started with this holey sweater in my closet that I thought was the perfect canvas to give felting a go. That was followed by my Put a Bird on It number and my attempt at copying an Anthro sweater...twice. 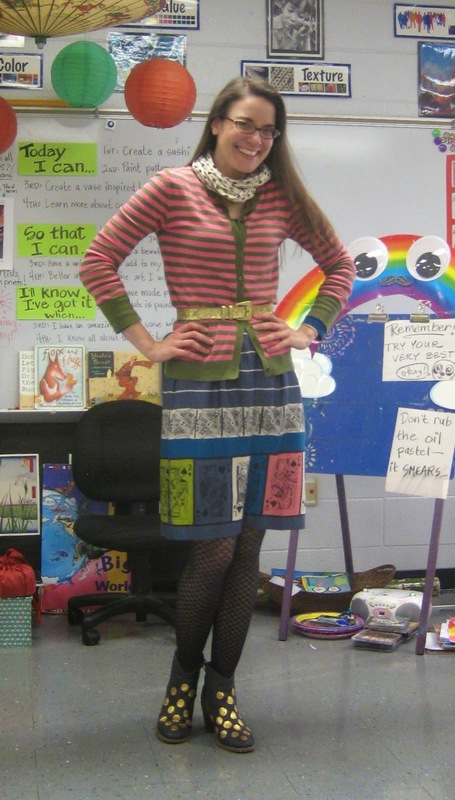 After that, I ventured away from sweater felting and stabbed a wool beret and a skirt thus creating The World's Tackiest Art Teacher Outfit. I then felted my cat, a dog and an owl. I took a summer hiatus (working with wool isn't real fun in the summer heat) but then this winter I was back at it, stabbing a Starry Night dress and a van Gogh's Sunflowers sweater. I told you! It's totes addicting! I mean, I'm addicted because it's addictive. Oh, whatever. So when an art teacher buddy of mine suggested we felt a fox stole sweater, the stabbing commenced. 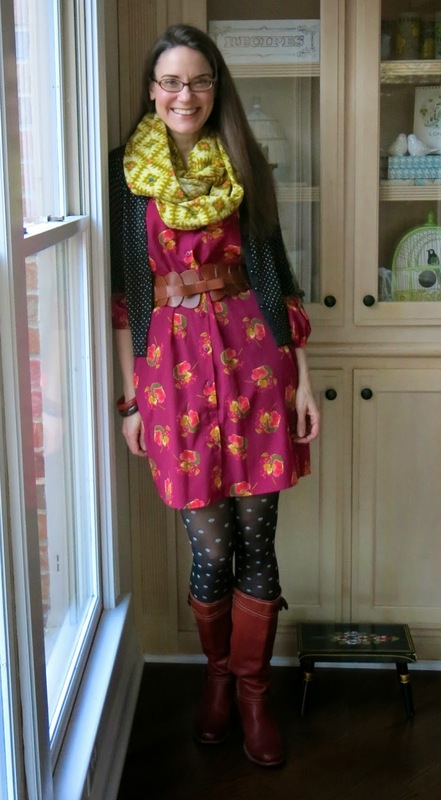 Our inspiration came from the super presh etsy shop dandyrions. 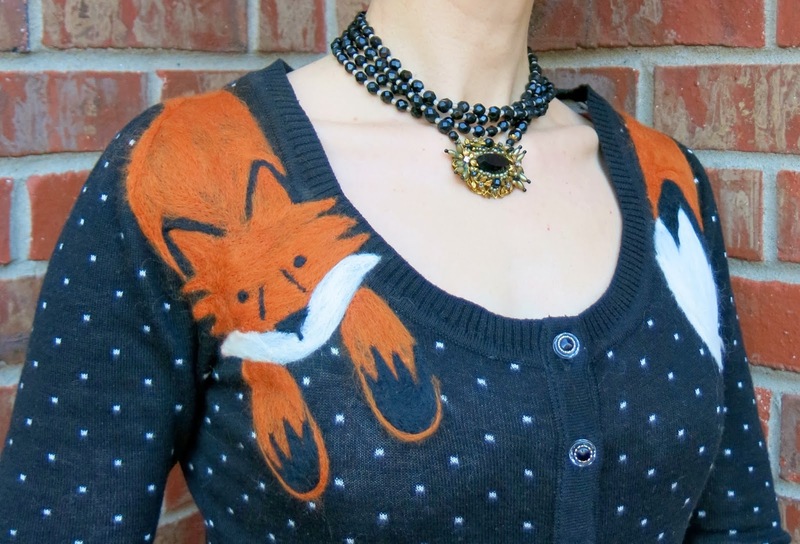 These adorable sweaters and shirts have faux fox and raccoon stoles that are actually made of felt fabric and appliqued on. Insane cuteness. We decided to go the felt roving route for our foxy stole. Now, I don't think I've ever done a super fabulous job of explaining the process of felting to you. To remedy that, about a year ago, I made a series of short clips where I chat about the supplies needed and the process of felting. I'm hoping these videos prove to answer any felting questions you might have...even if they are terribly goofy. This sweater DIY really does date this video! By the way, after seeing some ridiculous prices on needle felting supplies at my local big box craft store that shall go unnamed (rhymes with "Fichael's"), I did a wee bit of homework and found most of the supplies available here. Dudes! This website even has little finger-protecting sheathes that look like finger condoms (go here and look, I ain't makin this up). So gonna order me some of those! My apologies for the lack of zoom in. I didn't think you'd wanna get to close to my wrinkly grandma hands. Honestly, I learned needle felting by watching far better how-to videos on youtube than this. I just wanted you to see how stinkin' easy it is. What I was doing was pretty small and detailed...a big ole foxy stole? Much easier. When attempting a sweater, I usually make a paper template, pin that to the sweater and create a felt outline, usually in 100% wool yarn (see the cat sweater). For this sweater, I was feelin' frisky so I just sketched it on in yellow chalk. With my cushion underneath, I placed the roving on top (in mass wads like I talked about in the video because it tends to "shrink" as you stab) and started punching. How do you know when you've punched enough? Take a peak at the back of the sweater. You should see a lot of roving. That's your sign that it's locked into place with the fibers of the sweater. Adding the white for the muzzle. Working on the details. One of the reasons I love this process so much is that it goes quickly unlike my other fashion-altering love, embroidery. After the details of the face were complete, the rest came together easily. Even if it meant staying up a good three hours beyond my bedtime on a school night. The following day, I happened to have one kindergarten class that is waaay ahead of the rest (how does that always happen?!). Since we'd been learning about drawing shapes...and I was wearing my foxy sweater...we read a sweet little book called Fox and Fluff and got our foxy drawing skills on! For this activity, kindergartenland and I used black construction paper and drew with black oil pastels. Color was then added with oil pastels. I used the guided drawing directions from Art Projects for Kids. Most of the kids were able to finish off their foxes by the end of their 45 minute art time and they were so excited by their foxiness. Oh, and my art teacher buddy who suggested we go on this fox-felting adventure? She finished off her sweater too -- and this was her first felting attempt. Now guess who's the newest member of the Addicting to Felt Club? Thanks for your input, ya'll! Chat soon!